The above comes from an early fifteenth-century history pretentiously (or optimistically) called The Canarian, which concerns two French noble adventurers, Jean de Bethencourt and Gadifer de la Salle, who in 1402 set out to take the Canary Islands for the glory of Christianity and themselves, and who failed, because of the astonishingly effective resistance of the Canary Islanders–perhaps no people were ever better at throwing rocks–and especially because of their own squabbling, recorded by the monk Pierre Bontier and the priest Jean le Verrier in all its sordid, gossipy, and embarassing detail. After opening with intonations of high adventure, Bethancourt and Gadifer (barely) convince their sailors not to abandon them, then scavenge an anchor and boat from a captured ship, which they barely make off with, and which nearly get them arrested on accusation of piracy at their next port. Then a chunk of their sailors run away. “Les estranges choses,” to be sure, but not ones we’d likely to see Roland, Erec, or Lancelot suffer. They land at Lancerote where “Monsieur de Bethencourt went inland and made great efforts to capture some of the people of Canary, but without sucess, for as yet he did not know the country: so he returned to Port Joyeuse [their pretentiously named landfall] without doing anything more.” The history is crammed with such incidents, which demand a script by Joseph Heller (RIP) and a production by the Werner Herzog (also RIP, sort of) of Fiztcarraldo and Corba Verde. I’ll leave it to you to read it, to learn about the treachery of the wicked sailor Berthin, a slaver indifferent to the treaties his masters draw between themselves and the Canary Islanders, and who leaves Gadifer to starve on the island of Lobos; the Canarian king–a much better subject for a chivalric chronicle!–who breaks free from the slavers six times; and especially the two chaplains’ attempt at writing a handbook on belief for the use of future Canarian missionaries. In a rummage sale catechism, a true Summa, disordered and containing all they could imagine, the fundamental knowledge of the faith includes the characteristics of bitumen, used to seal Noah’s ark (only menstrual blood can dissolve it); the paleness of Jews, “descoulourez” by fear; and whether the Host should be made of leavened or unleavened flour (useful knowledge for a people who made no bread!). At the end (p. 90), they say they’ve done this “as simply as we could according to the knowledge which God has given us” (good job, God!) and they hope that someone later can “explain the Articles of the faith better than we have been able to do.” I doubt it. Only sardonic or disgusted laughter is really appropriate here, as the Canarians were among the first victims of the great age of Exploration. The two chaplains did want the islands conquered (in part because “here one may easily learn news of Prester John”). Within 90 years, all would be, not just the three least-populated ones Gadifer and Bethancourt managed to grab; and shortly after, the remaining populations would be dispersed, mostly to slave labor in Madeira. There’s much else to deplore: the frequent battles, increasingly won by the Europeans; the conversions, essentially coerced; the Canarian mother hiding from slavers who strangles her infant, perhaps to keep it from giving away her refuge. I can’t hold it in, though, at the the grotesque difference between the high style of crusade and the domestic squabbling that follows Bethencourt’s wife unfavorably comparing his age to that of his brother. We can take this historically, if we like, as a symptom of the twlight of the Middle Ages (but we’d be better off not doing this) and the end of private armies, or psychoanalytically, if we think of crusade histories and chivalric romance as the mirror in which our two heroes (mis)recognize themselves, or some other way, to be determined by you. Put it on your syllabus and see what happens. 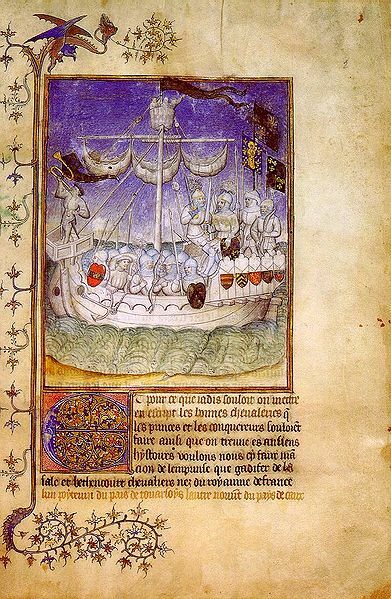 This entry was posted in MedievalBlog and tagged Canarian, Canary Islanders, colonialism, Gadifer de la Salle, Jean de Bethencourt, postcolonial by medievalkarl. Bookmark the permalink.